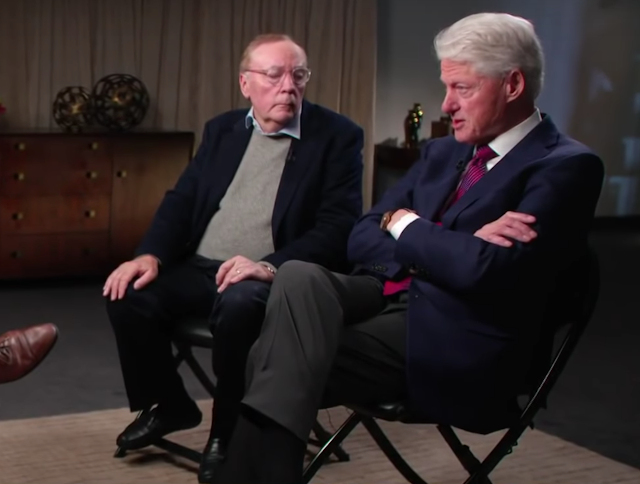 Bill Clinton and James Patterson were recently interviewed by NBC's Craig Melvin as part of their book tour for their recent collaboration, The President is Missing. During this interview published on Monday, Mr. Melvin asked President Clinton several questions regarding his affair with former White House Intern, Monica Lewinsky. What follows is a partial nonverbal analysis of this interview. In this image, captured as he says the word "Constitution" ("I think I did the right thing. 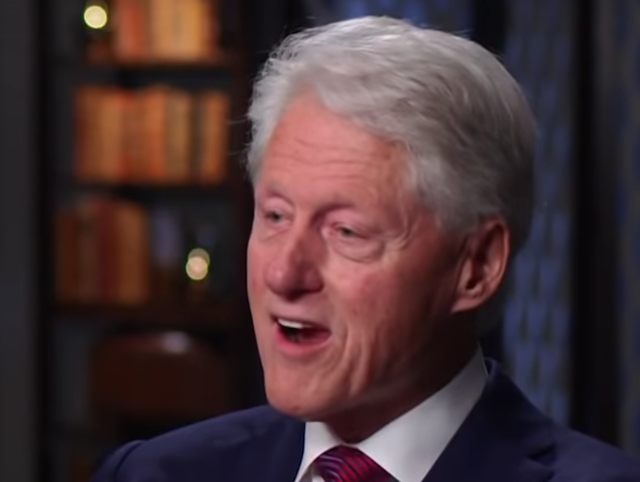 I defended The Constitution", during 1:37 - 1:40), Bill Clinton is crossing both his legs and arms. Few people will be surprised to know this conveys a significantly defensive mindset. While it's possible that a person sitting in this nonverbal posture may feel cold - and it's important to rule out that possibility - in this moment, President Clinton emotions are significantly beta, vulnerable, and of low confidence. He maintained this body posture throughout most of this interview. 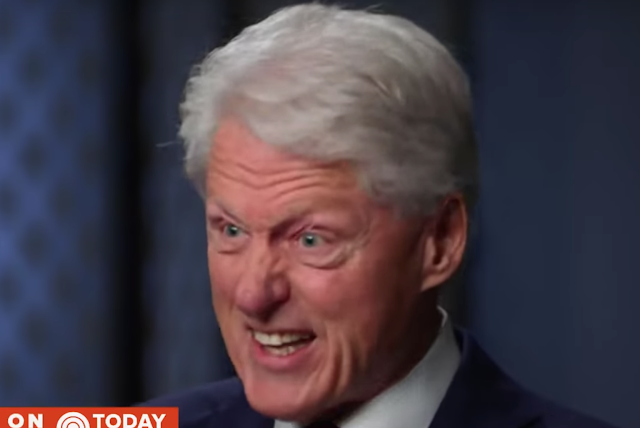 This image was taken during 3:35, as President Clinton says, "I had a sexual harassment policy when I was governor in the eighties" - and it shows a classic Rationalization Rapport Empathy Expression (R2E2). A Rationalization Rapport Empathy Expression may be of very short duration (a microexpression) - or it can last several seconds. Body language beginners will often confuse an R2E2 with a disgust display - yet the underlying emotions of each are vastly different (How do to differentiate between these two signals?). • How do I feel about their overall level of sincerity (What's their Sincerity Quotient)? • What are my gut feelings of their motive(s)? • What was their primary emotion as they spoke? • What, specifically, are they trying to convince me of/for what are they trying to Gain my Rapport? • Do they truly believe what they, themselves, are saying? • Are they feigning a weakness?/Trying to Gain my Empathy? If so, what is it? Why? A person displaying of an R2E2 expression is actively rationalizing. They are either trying to convince themselves of something - and/or they're also trying to recruit you to agree with them - as a Co-Rationalizer. • a Partial (Insincere) Mouth Smile. It's important to point out that all three of these emotions may also be manifested by different facial expressions. But we all make this expression, on occasion - yet those people who make it frequently with high probability are Sociopaths (Antisocial Personality Disorder). Another superimposed and simultaneous nonverbal signal (3:36 - 3:40, 3:44 - 3:45) which can't be captured in this still image - due to its movement - is what is called a Self-Righteous Head Wiggle (SRHW, aka, High-Confidence Head Wiggle). A Self-Righteous Head Wiggle is a relatively rapid, side-to-side motion of the head and neck. Sometimes it occurs with a similar movement of the torso - and on occasion the jaw as well (and may be even isolated to only the jaw). Sometimes the SRHW is very brief (a near-microexpression) - however, in these examples, it's a few seconds in duration. The Self-Righteous Head Wiggle (SRHW) is commonly displayed during moments of hyper-alpha emotions of particularly high confidence - and primarily while also verbally expressing similarly strong opinions. It's somewhat helpful to think of the Self-Righteous Head Wiggle as one variety of nonverbal swagger. Please watch this video several times to note it's full context and dynamic nature. 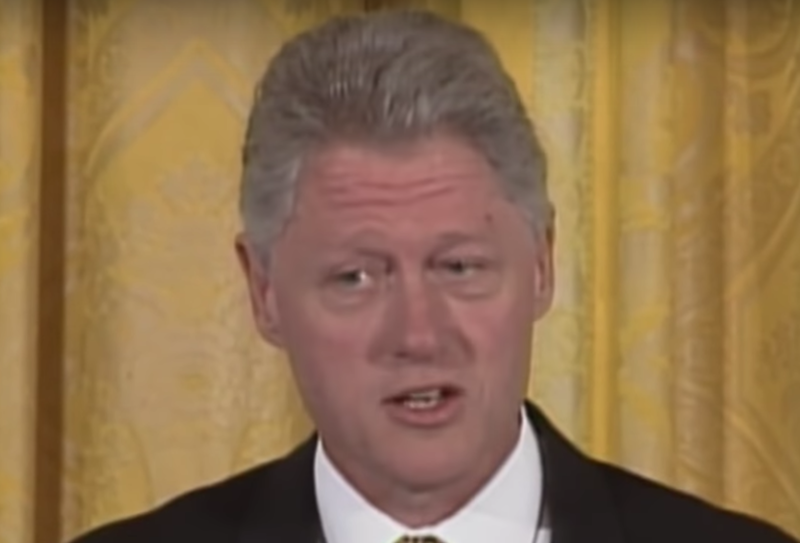 Now, look at this image taken from a later moment in this video which includes an older segment of President Clinton during his 1998 Public "Apology" (4:22) as he says, "... Monica Lewinsky ..."
• Raised Right Eyebrow (with his right forehead also being preferentially contracted just above it) - projecting an additional emotion of Disbelief/Incredulity. This expression does NOT project sincerity or empathy - and it's absolutely NOT an expression which should ever accompany an apology (Notice his face did not adopt this same expression when President Clinton speaking to his family). In this moment (4:49) as James Patterson comes to The President's defense - it shows Clinton in a Tongue-in-Cheek configuration which, in this context, signals the thought-emotion of I Just Won. 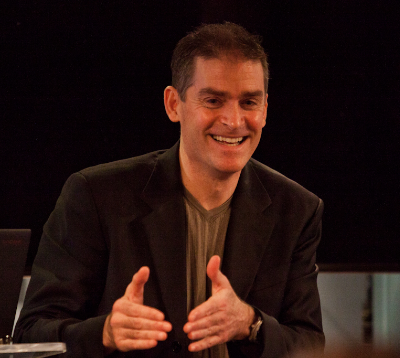 Whenever an apology is made - whether during a relatively small everyday event with a single individual, in a workplace environment, or an entire nation - from a psychological perspective as well as from a crisis management perspective - several key elements must always be included if the apology is to interpreted as sincere. 1. An apology must always be given by the person who committed the act in question - not by a manager, an attorney, a press secretary - or other surrogates. 2. An apology must never be scripted - but must be spoken from the heart. 3. An apology to the public should be given live - with press access. While some substitute this with a prerecorded video-audio format - this projects an attempt at control and viewed as considerably less sincere. A public apology to a person or group should never be a substitute for apologizing face-to-face. 4. There must be a clear acknowledgement of responsibility. 5. A commitment to change must be made - so as to prevent further infractions. 7. Asking for forgiveness is required with an apology (e.g., Saying, "I'm sorry", while required - is incomplete. One must also say, "Please forgive me", or "In time, I hope you will find it in your heart to forgive me", or similar. 8. Regret must be expressed - "I very much regret what I did to you". 9. The vocal qualities (tone, cadence, volume, etc.) must be congruent with sincerity. 10.The facial nonverbal signals and other body language displays must reflect sincerity. SUMMARY: This analysis does not address the political ramifications of President Clinton's relationship with Monica Lewinsky. Nor does it address the immorality vs. morality of an extramarital affair. 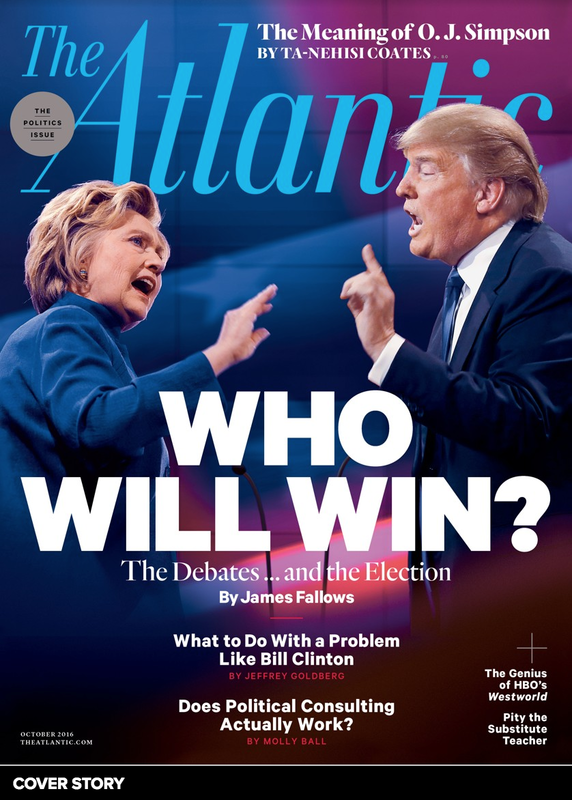 Rather it focuses on some of Bill Clinton's nonverbal behavior - and what constitutes an emotionally intelligent and evolved apology. I call upon President Clinton to publicly re-address his statements and his stance taken in this video - and the manner in which he believed he "apologized" to Monica Lewinsky. Bill Clinton should sincerely apologize to Monica Lewinsky - and this can only be fully conveyed in-person. 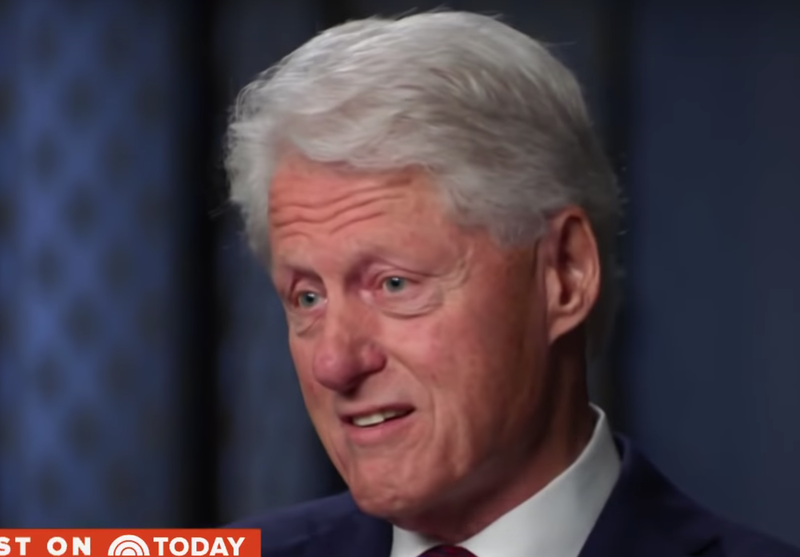 In addition, President Clinton should state publicly that he was absolutely wrong and that the burden of responsibility was completely on him, not Monica Lewinsky. When a person fails - and fails privately - then one day recovers to right their wrongs - they become better a better person. That's growth. That's maturity. That's character. When a person fails - and fails publicly - then one day recovers to right their wrongs - we all become better people by their example. That's leadership.